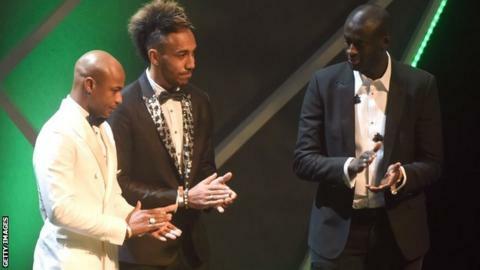 Manchester City midfielder Yaya Toure has reacted angrily after failing to win the Confederation of African Football's player of the year award. The 32-year-old, who captained Ivory Coast to Africa Cup of Nations success last year, was second behind Gabon striker Pierre-Emerick Aubameyang. "I think that's what makes the shame of Africa," he told Radio France International. "To behave in this way is indecent! But what can we do?" In a vote of coaches and technical directors of Caf nations, Borussia Dortmund forward Aubameyang got 143 points, with Toure on 136 and Ghana and Swansea midfielder Andre Ayew on 112. Toure, BBC African footballer of the year for 2015, had won the Caf award in each of the previous four years. Aubameyang, 26, is the first player from Gabon to win the award. He has scored 18 goals in 17 Bundesliga games this season and 68 goals in 119 games since joining Dortmund from French side St-Etienne in 2013. However, Gabon were eliminated at the group stage of last year's Africa Cup of Nations. "We Africans, we do not show that Africa is important to us," said Toure. "We give more priority to what's going on elsewhere than in our own continent. This is what is appalling. "I give an example: it's Lionel Messi who wins all the trophies but it's Ronaldo who is Ballon d'Or. What would you say? It would be unfair. "Yaya will look after himself, and let Africa look after itself. Like I'm often told, you shouldn't worry too much about Africa, because Africa will be the first to let you down."